Keratoconjunctivitis sicca (KCS) or dry eye describes the changes in the cornea which result from the lack of tear production. 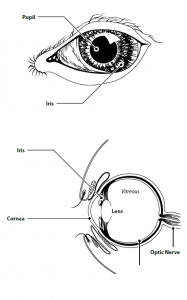 The cornea is the clear portion in the front of the eye. Like all living tissue, the cornea requires a supply of oxygen and food for energy. As the cornea has no blood vessels, oxygen and food is supplied through the three layered ‘tear film’. The outer most layer of the tear film is an oily layer supplied by glands in the eyelids and it helps to prevent evaporation. The middle layer is the watery layer produced by the lacriminal gland. The innermost layer is in direct contact with the cornea and is a layer of mucous produced by glands located in the conjunctiva. The mucus layer helps the water layer remain attached to the cornea. KCS is a lack of production of the watery layer of the tear film. This loss results in dryness of the corneal surface, which is uncomfortable. When the cornea is deprived of oxygen and food, it rapidly undergoes scarring that may lead to partial vision loss. There are several causes of dry eye including immune mediated inflammation of the lacrimal gland, hypothyroidism, and infections of the lacrimal glands. Loss of nerve impulses to the lacrimal gland may also cause dry eye. Another cause of dry eye is a toxic effect produced by some sulfa-containing drugs. Some of these drugs may have been given for the treatment of other diseases. Diagnosis of KCS is made by performing a Schirmer tear test, which measures the volume of tears produced in one minute. A fluorescein stain (a bright green stain) may be used to identify a possible corneal ulcer and to assess the rate of the tear film breakup. The most important medications in the treatment of dry eye are Tacrolimus or Cyclosporine. These drugs increase natural tear production as well decrease inflammation and irritation to the eye. Unfortunately, some patients do not respond to therapy making other treatments necessary. In addition to increasing tear production, there may be a need to reduce the overgrowth of bacteria that is common in the dry eye syndrome. The dry eye patient frequently has a buildup of mucus in the folds of the eyelids. This mucus is food for bacterial growth. These bacteria may not be disease-causing bacteria but they do need to be controlled with an antibiotic. Topical anti-inflammatory drugs may be used to reduce inflammation and corneal scarring. Along with antibiotics and anti-inflammatory drugs, artificial tear ointments or solutions are used to provide extra lubrication. Occasionally patients with loss of nerve impulses are treated with pilocarpine given by mouth. This drug stimulates the lacrimal gland. Unfortunately, pilocarpine may also stimulate glands all over the body causing vomiting, diarrhea or decreased appetite. Most patients with dry eye will do well if medications are administered on a regular basis. In cases where medicines do not work, surgical techniques may be considered. A parotid duct transposition or PDT (surgical movement of a duct from a saliva producing gland) is available. The PDT is needed in patients who have had no response to medication. This involves redirecting a salivary duct from the mouth to the eye so that saliva substitutes for tears. The operation is not without problems or future complications and is recommended only after an intense effort has been made to treat the condition with medication alone. Your patience and determination are critical to your pet’s comfort because medical attempts to correct the condition may take weeks to months or may never be entirely successful. Even if normal tear production never returns, you can provide increased comfort to your pet and usually preserve vision. Providing eye lubrication during the treatment period is very important because keeping the eyes moist decreases corneal scarring.